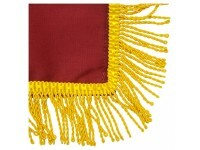 Customize your flag with 2in Gold Fringe for use with indoor flag stands, in parades and special events. Can be added to flag sizes: 2' x 3' , 3' x 5' , 4' x 6' , 5' x 8' , 6' x 10' only. .. 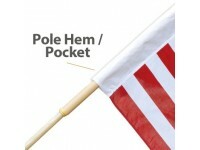 Available Options:Customize your flag with Pole Pocket (Pole Hem) and Mounting Tabs for use with indoor flag stands, in parades and special events.Hem is 3in flat, open top with leather tab.Can be add..